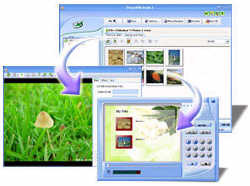 Powerful Photo to DVD VCD SVCD Maker, an absolutely powerful yet easy-to-use tool to create stunning slideshows DVD VCD SVCD with your digital photos for display on TV. Photo 2 DVD Studio is an absolutely powerful yet easy-to-use tool to create stunning slideshows with your digital photos for display on TV. 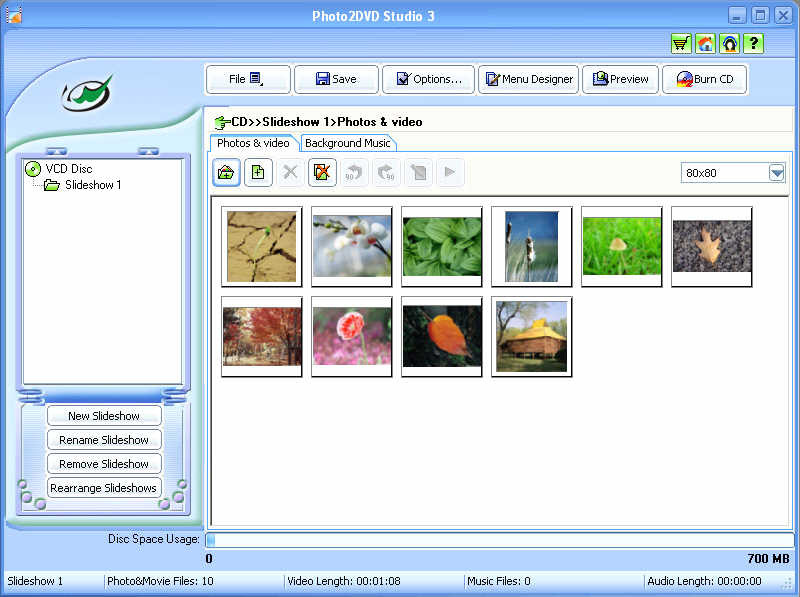 Whether you are an expert, a novice or anywhere in between, you can easily but professionally combine photos with music, texts and blank slides and add video clips with this excellent software. It includes nearly 150 transition effects for you to choose from to switch between photos and video clips in any way you want. Burn your slideshows in VCD, SVCD or DVD format and share your special memories with your friends and family! What can Photo 2 DVD Studio do for me? Transfer your favorite digital photos to stunning slideshows with background music, texts, and blank slides, and burn your slideshows to DVDs. Archive your digital photos on a DVD and keep them everlasting. Make gift DVDs and share your digital stories on TV with your family and friends. DVD Authoring - Directly and easily burn slideshows to DVDs without using any additional tool. Special Ken Burns Effect - Make your still photos come to life using Ken Burns effect. Video Clips Supported - Import video clips to bring life to your slideshows. A Wide Variety of Transition Effects - Nearly 150 transition effects are included. Multiple Background Music Supported - Support multiple audio formats, multi-file addition, and more. Separate Duration Settings - Separately set photo effect duration and transition effect duration for each photo. Wondershare DVD to iPod Ripper is a powerful DVD Ripping software for Apple iPod video. With the latest MPEG-4 video encode technology-XviD & H.264, you can easily convert all kinds of DVD to iPod video (mp4) format with highest conversion speed and excellent conversion quality.